Remind yourself each day of what's important, and no matter what, we are in charge of our own happiness. Use these guidelines as a daily reminder to what really makes us happy. Our wall decals are ideal for bedrooms, offices, living rooms, entryways, classrooms, even your car, bathtub or glass shower doors! 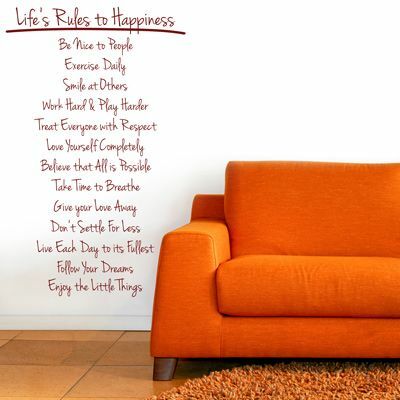 This Life's Rules decal is shown here in our Large size, and measures 27 inches wide by 44 inches high. Small size measures 13.5 inches wide by 22 inches high. Medium size measures 22 inches wide by 35.5 inches high. The small and medium versions our Life's Rules to Happiness decal come in one piece, ready to apply, but can be cut apart if you would like to separate the lines of text to create your own look. The large version comes in two sections for easier application.